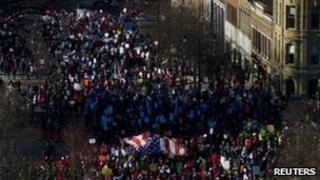 Nearly 70,000 protesters have taken part in rival protests in the US state of Wisconsin over moves to curb union activity. Saturday's rallies were peaceful despite angry chants on both sides. Union supporters in the state capital Madison outnumbered the pro-Walker rally, organised by the conservative groups Tea Party Patriots and Americans for Prosperity, the Associated Press news agency reports. Among the Walker supporters was "Joe the Plumber", real name Samuel Joseph Wurzelbacher, who figured in the 2008 Republican presidential campaign. His message was: "Unions don't deserve anything, you don't deserve anything, you work for it yourself!" Anti-Walker protester Jim Schneider, 69, waved a sign with "Hosni Mubarak?" written next to a picture of the governor, who has refused to negotiate with the unions. "The Egyptians have been a great example to us," the retired teacher said. "What happens here is going to be very important to what happens in a lot of other states, just like the thing that happened in Egypt had an effect on a lot of other countries in the Middle East." Wisconsin faces a $3.6bn (£2.23bn) budget deficit in the coming two-year period and the public employee bill is expected to save $300m in that period. Governor Walker insists he has the backing of the state's voters, arguing that the bill is necessary to avoid painful job cuts.